Brontorina has a dream. She wants to dance. 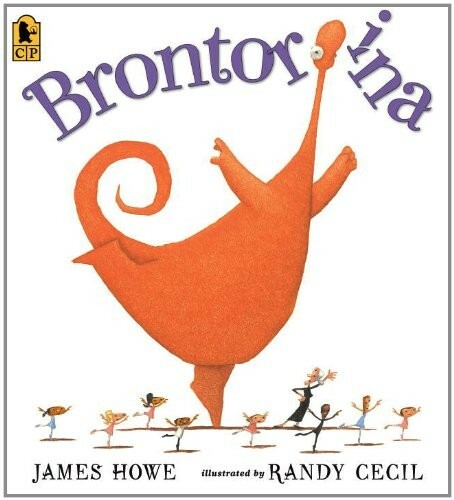 But Brontorina is rather large -- too large to fit in Madame Lucille's dance studio. Brontorina does not have the right shoes, and everyone knows you can't dance without the proper footwear. Still, Brontorina knows, deep in her heart, that she is meant to be a ballerina. James Howe introduces a lovable dinosaur whose size is outmatched only by her determination, and whose talent is outmatched only by her charm. Accompanied by Randy Cecil's beguiling illustrations, here is an irresistible story that proves that no problem is too big when the heart and imagination know no bounds. This sweet and funny story encourages kids to consider talent and heart before appearance — and reminds them that many "rules" about what people should look like are easy to change.